The next issue of the Militant will be printed on Monday, June 14, and mailed out the next day. It will be a two-week issue. We will resume publication with issue number 26, which will be mailed out Thursday, July 1. 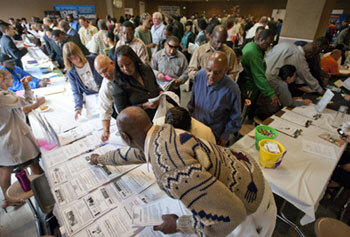 Workers seek jobs at annual job fair organized by Los Angeles Mission, a homeless organization in Los Angeles, June 3. U.S. employment officially grew by 431,000 in May, 95 percent of which was result of governments creation of temporary census jobs. According to the U.S. Labor Department, employment grew by 431,000 in May. This was the biggest gain in jobs in 10 years, reported the Wall Street Journal. But the overwhelming majority of hiring in May411,000 jobswas for temporary census workers, whose jobs will be eliminated after a few months. For millions of workers unemployed for months and in some cases years, little has changed. Over the past 12 months the U.S unemployment rate has hovered around 10 percent. For Blacks the rate is 15.5 percent. The official unemployment rate did decline slightly to 9.7 percent in May, from 9.9 percent in April. At the same time, jobs in the private sector grew by 41,000, the smallest amount since January. Today there are 8 million fewer workers on private payrolls than there were when the recession opened in December 2007, the Journal acknowledged. Nearly half of private sector employers are cutting jobs, reported CNNMoney.com, despite the rise in manufacturing jobs last month by 29,000 and mining employment by 10,000. In construction, 35,000 jobs were eliminated in May. Hewlett Packard, the worlds largest personal computer maker, announced in early June plans to slash about 3,000 jobs over several years. Among public employees, the picture is also grim. More than 400,000 may have jobs for a few months taking the census, but tens of thousands face layoffs from state and local jobs every month as the rulers slash education, health care, and other programs. In May alone, 22,000 state and local government jobs were axed. In May the government counted 15 million people as unemployed. However, this does not include another 2.2 million workers dubbed marginally attached to the workforcehalf of them labeled discouraged workers. With job prospects improving, more of these workers are actively looking for jobs, boosting the governments count of unemployed workers. The number of long-term unemployed remains at record levels. About 6.8 million have been out of work for at least six months, while the average length of time they remain without a job rose to eight months. Many find that the longer they are unemployed, the harder it is to convince bosses to hire them. and the third-biggest point and percentage decline of 2010, reported the Journal.